Comprised of over 7,100 islands in Southeast Asia, the Philippines is an archipelago filled with natural beauty and rich culture. Along with its rich biodiversity, white sandy beaches, mountain ranges, and tropical rainforests, the country’s colorful history is filled with a unique blend of cultures. Known for their warm hospitality, contagious smiles and delicious food, Filipinos truly make the Philippines a very special country to visit. While experiencing the cultural diversity and natural beauty of the Philippines, learn about the organization of its primarily devolved health system and the various challenges in providing adequate healthcare in the context of its peculiar geography. In many remote, hard-to-reach islands, otherwise known as geographically isolated disadvantaged areas (GIDA), hospitals and health care clinics strive to deliver quality health services despite the often inadequate infrastructure, investment, supplies and personnel. Experience first-hand the daily healthcare challenges faced by “barangays” or villages, on remote islands in the provinces of Quezon, Lubang, and Romblon. During rainy season (summer months) rotations on remote islands may not be available, in which case suitable alternative mainland rotations will be arranged. Visit premiere urban public and private health facilities in the capital city of Manila prior to the remote island immersion for a better appreciation of the dichotomies between public versus private and rural versus urban healthcare systems. Meet local health professionals at the Department of Health, and enjoy cultural lectures and excursions led by CFHI's on-site partners. This program offers life-changing firsthand exposure to the struggles and triumphs of local people working together to achieve better health outcomes for their communities. Rural Health Unit (RHU)/Clinic– The RHU is the main public health care facility that provides health services in these remote areas. Its operations are supervised by a medical doctor called the Municipal Health Officer (MHO), who will be your local preceptor, assisted by nurses and midwives. The clinic offers primary care services such as general consultations for patients, prenatal checkups, live birth deliveries, vaccinations/ immunizations, health education sessions, dental services, and selected laboratory services. It is also the principal implementing unit for public health programs on maternal and child health, reproductive health, communicable and non-communicable diseases, nutrition and sanitation among others. Join the MHO and the rest of the RHU staff and learn more about public health program implementation and health service delivery networks at the grassroots level. Barangay Health Stations (BHS) – The BHS is an extension of the RHU located at the village or “barangay” level. It is usually manned by a nurse and/or a midwife, assisted by local community health volunteers called barangay health workers (BHW). Participants will have the opportunity to shadow BHS staff as they conduct primary care consults, prenatal check-ups, actual vaccinations/ immunizations, health status monitoring and health promotion activities at the barangay level. Department of Health (DOH) – The Philippine DOH is the national health agency responsible for ensuring access to health services for all Filipino citizens. Participants will learn about the basics of the Philippine health system through lectures, visit to key offices and informational interviews with select DOH staff. University of the Philippines-Philippine General Hospital (UP-PGH) – The PGH is a tertiary state-owned hospital administered and operated by the University of the Philippines Health Sciences Center. It is generally considered as the largest public tertiary hospital in the country with a 1,500-bed capacity and is the principal end referral hospital for mostly indigent patients from all over the country. Participants will be exposed to various departments and service areas, from the outpatient department to the emergency room and the service wards for a glimpse of the current realities that define the Philippine health care system. Urban Health Care Facilities – Participants will do walkthroughs of selected urban health facilities, particularly a tertiary private hospital offering comprehensive specialized medical care services and an urban public primary care center to provide a frame of reference for analysis of the country’s rural versus urban health set-ups. The program begins with a three day introduction to the Philippine health care system through visits to key exposure sites in Metro Manila. This is followed by an intensive immersion in selected remote island sites in the provinces of either Quezon, Lubang, or Romblon, as determined by the Program coordinators. Metro Manila - Also known as the National Capital Region (NCR) of the Philippines, Metro Manila is composed of sixteen cities and one municipality, whose overall population is estimated at 12 million. It is considered as one of the most densely populated cities in the world. NCR is the center of culture, economy, education, and government of the Philippines, which makes it the country's hub for finance and commerce. Quezon – Alabat Island is the primary immersion site in Quezon Province. It is located about 250 km (155 miles) southeast of Metro Manila, situated between the Pacific Ocean and Lamon Bay. From Metro Manila, Alabat Island is reachable by 6-8 hours land travel plus one hour boat ride. It is composed of three municipalities or towns: Perez in the north, Alabat in the middle and Quezon in the south. Participants who will be assigned to Alabat Island will be specifically placed in the town of Quezon, working closely with the Rural Health Unit staff. Romblon – Tablas Island is the primary immersion site in Romblon Province. It is about 367 km (228 miles) south of Metro Manila, situated between Tablas Strait and Sibuyan Sea near the geographic center of the Philippines. It is the largest island among the 7 islands that comprise the province of Romblon. From Metro Manila, Tablas Island is reachable by 2-3 hours bus trip to the Port of Batangas, followed by an 8-10 hours travel by passenger ship to the Port of Odiongan. Participants who will be assigned to Tablas Island will be specifically placed in the town of Alcantara, working closely with the Rural Health Unit staff. Lubang Island is located 183 km (75 miles) southwest from Metro Manila. It is separated from the main island of Mindoro and Luzon by the Verde Island passage. The island is divided into two municipalities: Lubang and Looc. The Municipality of Lubang is one of the eleven municipalities of Occidental Mindoro and it occupies the northeastern part of Lubang Island, including the island of Cabra. From Metro Manila, Lubang is reachable by a 3-hour van ride to Nasugbu Port, Batangas, followed by a 3-hour boat ride to Tilik Port, Lubang. Participants who will be assigned to Lubang will be placed within the Poblacion, working closely with the Rural Health Unit staff. CFHI participants have free time during most evenings and weekends and may choose to organize weekend trips to nearby destinations and take part in cultural activities offered in and around the program sites. Metro Manila - Metro Manila, with its 16 cities, is a crowded, fast-paced environment with much to offer. The city of Manila has a reputation for being a concrete jungle where you can eat, drink, and shop 24 hours a day. Explore Intramuros, the old walled city showcasing the preserved architecture during the Spanish era and watch the world famous Manila Bay sunset. The nearby business districts of Makati and Taguig, with tall skyscrapers and fine restaurants, are known for their cosmopolitan and upscale vibe. Pasay City, where the international airport is located, boasts of one of the largest malls in the world, the Mall of Asia, and various gaming and entertainment establishments. Embrace all that the rest of the metropolis has to offer while immersing yourself in the vibrant Philippine culture and mouthwatering gastronomic delights. Quezon and Romblon - Unlike Metro Manila, islands in the provinces of Quezon and Romblon offer a much slower paced life. However, these islands are excellent locations to appreciate the Philippines’ natural beauty and biodiversity. In Alabat Island, enjoy picnics by the beach and lazy sun-kissed afternoons. Make sure to try the local delicacies, most notably the exotic mangrove-inhabiting crustacean known as “takla”. For the more adventurous, hike to the falls of Barangay Sabang or take a one-man motorboat to the nearby islet of Pulong Pasig to enjoy it pristine waters and white sand beach. In Tablas island, find secluded white sand beaches along its vast coast line or visit the nearby town of Looc to snorkel and feed the colorful fishes at the Looc Fish Sanctuary. For the more rugged and outdoorsy types, you can hike the various trails to discover hidden falls. And if this is not enough, you can do island hopping to the island municipalities of Romblon and San Jose, or even go to the Philippines’ most famous island destination, Boracay. For the first few days and final night, participants will be lodged in a three star hotel in Manila with basic amenities such as hot shower, air conditioning and internet wifi connection. Accommodations will be in a twin-sharing room, separate beds, with males and females in separate rooms. For the time spent in the remote island sites in Quezon, Lubang, and Romblon provinces, participants will live in identified local lodging. This can be either in a homestay or in an apartment/dorm-type lodging, depending on availability and as chosen and screened by the CFHI Local Coordinators. Please note that the accommodations do not include facilities like air conditioning, internet, telephones, showers and hot water bath. Accommodation in Metro Manila and in the remote island site includes two meals per day. A local prepaid cell phone will be provided to each participant upon arrival. For official CFHI activities, all transportation will be arranged and covered by the program. This CFHI program is ideal for students and non-students of all levels and health disciplines. Anyone interested in and passionate about global health and medicine is welcome to participate. However, program applicants should be physically, mentally and emotionally prepared to step outside their comfort zone and brave the peculiarities in a remote island and low-resource setting. In particular, this program will focus on challenges faced in providing adequate medical care in both urban and rural settings and deepening understanding of health inequities. For more information, please read CFHI's general eligibility requirements. The Philippines is a multicultural and diverse country with approximately 175 different languages. The two official languages of the Philippines are Filipino (Tagalog) and English. Over 90% the Philippine population speaks English and it is one of the primary languages of instruction. English is widely spoken by most professionals and used frequently in many business and academic settings. CFHI staff in the Philippines and healthcare professionals at the various clinical and public health sites you will interact with communicate effectively in English. However, you will find that daily communication amongst locals and community members will be in Filipino (Tagalog). Participants should arrive in Manila, Philippines on the program start date and will be picked up from the airport by a CFHI representative and taken to their on-site lodging. As much as possible, participants are requested to book flights that will arrive Saturday, after 12 noon local time. The first official activity of the program is an Orientation Meeting followed by a Welcome Dinner that takes place on the Sunday after arrival. No visa is required for U.S. citizens for stays 30 days or less. For stays of 30 days or more you must apply for a 59 day visa at the Philippine Embassy or Consulate prior to arrival. If you are participating in a 2 week program, but plan to stay in the Philippines for longer than 30 days, please notify students@cfhi.org at least 1 1/2 months in advance of your start date, so you have sufficient time to receive your visa and we can send you a Letter of Support (required document for visa application). We do not automatically send a letter of support to those participating for 2 weeks. CFHI Program fees include the majority of your in-country expenses. As a nonprofit, CFHI strives to keep fees low and offers fundraising opportunities, scholarships and discounts. Uniquely CFHI, 50% or more of student program fees go directly to the communities they will be visiting, benefiting the local economy at large and specifically underserved health systems. Dr. Buenaventura is a young and passionate doctor who is involved in global health diplomacy and in issues addressing health disparities and inequities. In 2004, Dr. Buenaventura graduated with honors at the University of Santo Tomas Faculty of Medicine and Surgery. The following year, he completed his postgraduate internship at the University of the Philippines General Hospital. In 2011, he earned a Masters in Public Health at Boston University, with a dual concentration in International Health and Heath Policy and Management and bestowed the John Snow, Inc. Award in International Health, after doing prestigious internships at the World Health Organization Headquarters in Geneva, Switzerland and the Médecins Sans Frontières (or Doctors Without Borders) US Office in New York. He has served as a Doctor-to-the Barrio, with seven years of grassroots experience as a rural health physician and later as a Municipal Health Officer in a poor, sixth class, remote island, serving as the only doctor in a town of approximately 10,000 people. Dr. Buenaventura currently serves as the Chief Health Program Officer for the Department of Health-Philippines with a focus on alignment of international health cooperation to local health system needs. Altogether, his valuable education and experience with global health and medicine made him a recipient of various grants and scholarships recognizing his leadership skills and academic excellence. Dr. Medina is a Community Medicine and Primary Health Care practitioner with more than five years’ experience in local health systems development as the Municipal Health Officer of the island municipality of Quezon, Quezon from 2009 to 2014. Since 2015 he has taught at his alma mater, the University of the Philippines (UP) College of Medicine, as an Assistant Professor for Community Medicine and is presently pursuing his Master in Health Professions Education degree from the National Teachers Training Center for the Health Professions in UP Manila. In his first year of teaching, he was awarded the UP Medical Alumni Society Outstanding Teacher Award for Clinical Clerks for AY 2015-2016. Erin graduated from UCLA with a Master’s in East Asian Studies in 2017. During her undergraduate years there, she helped found an NGO serving homeless college students. Since then, she has become even more passionate about going beyond merely serving the underserved by seeking to articulate, understand and harness the dynamics and intricacies of underprivileged and vulnerable communities. Thus, she has recently found herself back in her home country, primarily to learn more about the healthcare disparities in the Philippines and the steps being done to address them. Being part of the CFHI in the Philippines team provides her with an enabling environment where her interests, experiences, aspirations and advocacies help enrich the learnings of the participants in the CFHI Remote Island Medicine Program. Dr. Alejo is the current Municipal Health Officer of Quezon in Alabat Island in the Province of Quezon. He finished his medical education in 2017 at the University of the Philippines College of Medicine. Prior to taking up medicine, he finished his Master's Degree in Community Development while working as a community health nursing faculty, both also in the University of the Philippines. Aside from trying to escape the traffic in Manila, he decided to pursue a career in a rural/remote area as it provides the challenges of both health care and community development where practitioners of both fields can be of more help. Dr. Maestro is an excellent example of a public health physician serving his own hometown in the Municipality of Alcantara in Tablas Island, Romblon. To date, he has served as the Municipal Health Officer (MHO) of Alcantara for 10 years. He finished his medical school at the Far Eastern University Dr. Nicanor Reyes Medical Foundation in 2004. In 2011, became Public Health Specialist in Applied Epidemiology through the Department of Health’s local Field Epidemiology Program. As an MHO with a strong background in field epidemiology, he is highly capable in developing, implementing and monitoring public health programs in his locality. He is currently taking up his Master in Public Management, major in Health System Development at the Development Academy of the Philippines to further enhance his skills in public health policy and management. Dr. Hilomen is currently the Rural Health Physician of Lubang, Occidental Mindoro, under the “Doctor to the Barrios” Program of the Department of Health. 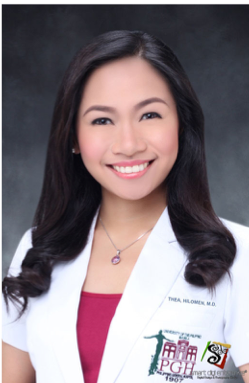 She graduated from the University of the Philippines College of Medicine in 2017. She is currently taking up a degree of Master in Public Management, Major in Health Systems Development under the Development Academy of the Philippines to strengthen her public health management skills and broaden her outlook on the Philippine health system.